University of Maine at Presque Isle alumus Bob Tarpey received a major honor this month for his work as an Athletic Trainer for the Toronto Blue Jays organization. Tarpey was named the 2014 Minor League Athletic Trainer of the Year by the Professional Baseball Athletic Trainers Society (PBATS). He was presented with his national award in early December by PBATS at the annual Baseball Winter Meetings in San Diego. Voted on by his athletic training peers in PBATS, this award is given annually to an athletic trainer that exemplifies the best in athletic training for their players and demonstrates a deep concern for the community and fellow athletic trainers. A native of York, Maine, Tarpey graduated from UMPI in 2003 with a Bachelor’s degree in Athletic Training. He has returned to campus several times to guest lecture for the Athletic Training Program, and he visits with UMPI alumni and students each year during the Eastern Athletic Trainers’ Association District conference. 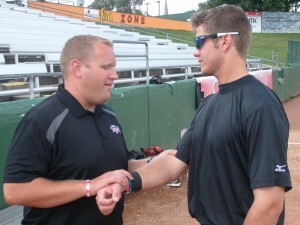 Tarpey received his Master’s degree in Athletic Training from California University of Pennsylvania in 2005, before beginning his career in baseball with the Toronto Blue Jays organization in 2006. For the past five seasons, he has served as an Athletic Trainer for the New Hampshire Fisher Cats. In August, he was honored with the PBATS Eastern League Athletic Trainer of the Year Award. The honor comes as part of a busy off-season for Tarpey. In addition to the two honors, he was married in early November.